Apparently this is not an Onion article. I didn't know the Chinese took fetal education so seriously. THE popular practice of "fetal education'' by stimulating the fetus in the womb can be dangerous if done improperly or not done very gently, local doctors warned yesterday. A local woman who was seven months pregnant was rushed to a hospital on Sunday with severe stomach pain after patting and pressing her belly in an attempt to teach and play with her baby. 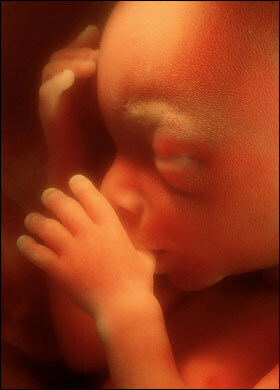 Fetal education" is based on the belief that early art exposure and exercise are beneficial for fetal growth. "Gently patting the stomach is considered a good interaction between parents and the fetus, and most local pregnant women have used such methods for fetal education," Dai said. "But women in late pregnancy and those with a history of miscarriage must become better informed. Too frequent or too 'violent' pressing of the belly can simulate the womb, causing false labor and even premature labor."